Get the Full StoryCardi B had one hell of a night at the Grammys, to say the least. 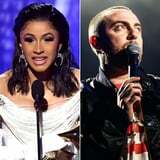 In addition to turning heads in a Disney-esque shell-like gown, the 26-year-old rapper took home her first Grammy for best rap album for Invasion of Privacy and made history as the first female solo artist to ever win in that category Lauryn Hill was the last woman to win with The Fugees in 1996 . Even though Mac did not win, he was honored during the in memoriam segment. Still, this did not go over well with Mac's ex Ariana Grande. Following Cardi's win, Ariana tweeted and quickly deleted "trash," "f ck," and "literal bullsh t." Given that she's friends with Nicki Minaj, fans immediately assumed she was throwing shade at Cardi you know, because she and Nicki have beef , but Ariana later clarified that it had "nothing to do with her." "She's not trash at all and that's not what I meant and u know that," she tweeted.